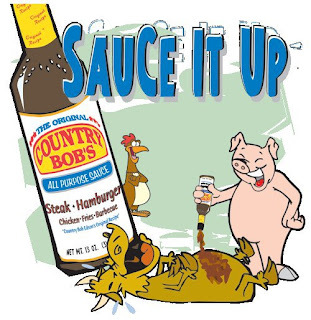 In 1968 Country Bob Edson created his All Purpose Sauce and began giving it to family and friends. Word got around about this wonderful sauce and he decided in 1982 to form a business and begin selling it. The company has grown tremendously in the past 30 years!! The humbleness of Bob Edson is very touching as well. "It would be nice if we could claim responsibility for the sucess of the company, however, credit must be given where credit is due. Proverbs 16:3 says 'Commit to the Lord whatever you do, and your plans will succeed'. We have placed ownership of Country Bob, Inc. in the hands of God." "Christ is our CEO" is written on their label! As a Christian that makes me want to support Country Bobs even more. That won't be hard to do though, since it tastes so wonderful! My 7 year old daughter is a very picky eater.. big surprise right. Well she doesn't typically like 'sauce' of any sort on her chicken, pork, steak. I cooked some chicken breasts on the grill and put Country Bob's All Purpose Sauce on at the end of the grilling to try it out. She wasn't paying much attention to the chicken and I chose not to alert her that there was anything different about it. She tasted it and says something that floored me. "Mom, what is on this chicken, it tastes wonderful!" She had me put some on her plate so she could dip her chicken in it. This is a girl who doesn't dip anything!! Woo Hoo we have a winner! Our entire family loves this sauce. We got 2 bottles to review and the 2nd is nearly empty. 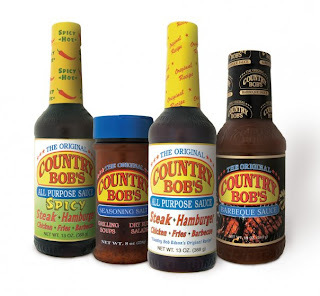 I read on the bottle, "People who try Country Bob's All Purpose Sauce become lifelong users". I just laughed because you honestly see things like that written on all kinds of products. This one is true though! I just told me family I better order some more of this sauce. They purpose to pull it out of the fridge to put on all meat products. Country Bob won us over!! I went online to Country Bob's to the store locator, and typed in my zipcode. Whoo Hoo, my local Walmart sells it and I hadn't even noticed it before. I am golden! I am seriously going to be picking up a few extra bottles to hand out to visitors to try. It is such a great sauce. Not spicy at all, not like a BBQ sauce, though they do sell one. The all purpose sauce is just that, for all kinds of things. If my 7 year old fussy daughter gave it two thumbs up I seriously think you should try it!